More than 200 Canadian musicians and industry players are standing in solidarity with Indigenous people in northern B.C. who have been protesting the construction of a natural gas pipeline on traditional territories. Members of Arcade Fire, July Talk and Arkells are among those who've signed an open letter to the Unist'ot'en camp and the Wet'suwet'en Nation saying they watched "infuriated" as RCMP units armed with assault rifles dismantled a checkpoint and arrested 14 people earlier this month. "We have heard your hereditary chiefs say 'No' to the Coastal GasLink development and we intend to amplify it," says the open letter also signed by the Sadies, Peaches and Tanya Tagaq. The removal of the blockade followed a temporary injunction issued by the B.C. Supreme Court preventing anyone from impeding Coastal GasLink's work until the defendants, including members of the Unist'ot'en camp, file a response. Coastal GasLink says it has signed agreements with all 20 elected First Nations bands along the pipeline route to LNG Canada's $40-billion export facility in Kitimat, B.C. 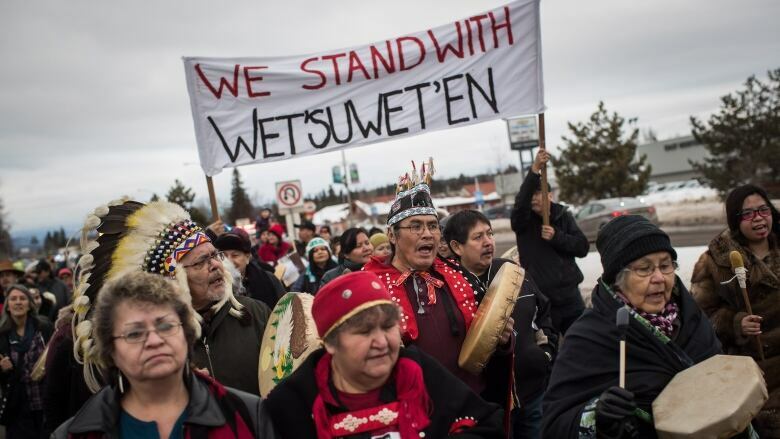 But the five hereditary clan chiefs within the Wet'suwet'en say the project also requires their consent. Prime Minister Justin Trudeau addressed the RCMP's actions to enforce the temporary court injunction as "not ideal," but said "the rule of law" and authority of Canadian courts must be respected. Meanwhile, the actions have sparked protests Canada-wide. "As musicians, we know a PR campaign when we see one: since 2015 Justin Trudeau has promoted a message of Truth and Reconciliation and professed the goal of building meaningful nation-to-nation relationships, but his government's actions don't align," the letter said. "Meaningful nation-to-nation relationships are not made at gunpoint."